The Story of Mr B. 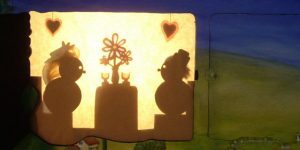 The Story of Mr B is a puppet show played between the pages of a giant book, narrated by a mushroom who introduces us to Mr Bumblegrum, a grumpy but endearing character, who makes a colourful journey through the seasons. With tenderness, surprises and humour, nature tries to comfort him.